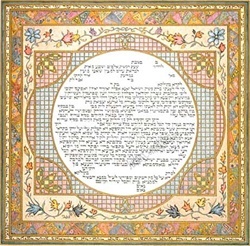 This Ketubah incorporates the colors of the Judean desert where archeologists have uncovered beautiful mosaic floors created centuries ago. 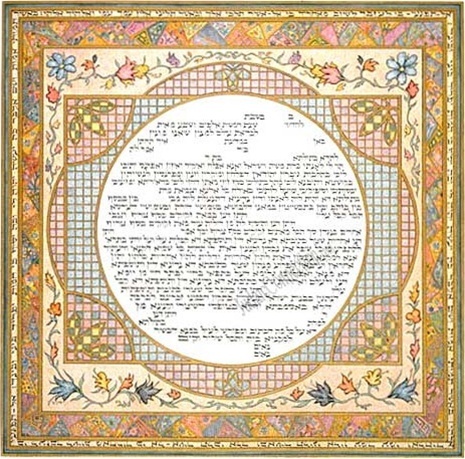 Piece by piece the pattern is formed, surrounding the circle, an ancient motif for the continuity of life. This piece was painstakingly rendered all in dots. 19" x 20"
..." For many, Fox has been seen as a realist, a hyper-realist, a magic-realistic. Why? Because his hand is superb, his technique is impeccable, and his paintings are accessible. But these labels are wrong all the same. What Fox produces is Fiction Painting. He imitates nothing and creates everything. He crafts the environment and its structures like a master architect. He places his characters precisely and intimately in dark corners of his stage … as deftly as a theatrical director. The viewer can even hear him whispering the dialogue into the ears of his performers. He colours mood and light as if behind the camera of an impossible cinema. Here is Babylon. Here is Bangkok. Here is the city of your dreams and there, the city of your fears. And here is Hell. All fictions, yet all alive and real and possible … despite the impossibility of everything."